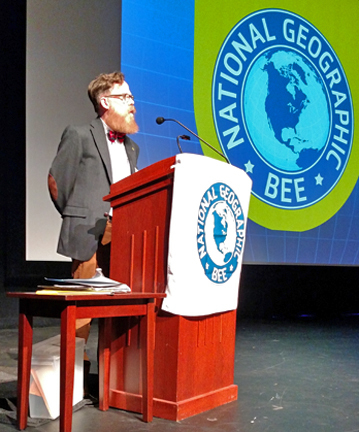 The Virginia Finals of the National Geographic Bee were held on April 1 at Longwood University. One hundred and two 4th-8th graders, winners of their school bees, competed in the Preliminary Rounds to select ten finalists. 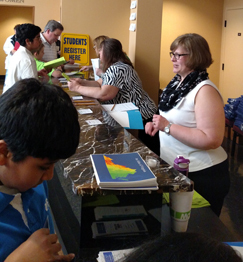 Among the participants were 4 fourth graders, 14 fifth graders, 18 sixth graders, 25 seventh graders, and 41 eighth graders. The VGA congratulates all for their victories and strong performances at the state Bee. Donna Fontaine, Smithfield Public Schools, was once again the State Bee Coordinator. Dr. Bill Carstensen, Virginia Tech Department of Geography, was moderator for the Final Rounds. Their exceptional performances certainly warrant praise. Austin Copeland, third place finisher, and at center is Prithvi Nathan, Second place winner. 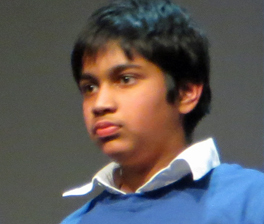 The winner of the 2016 Virginia Geographic Bee was Vishvesha Sridhar, Blacksburg Middle School, Blacksburg. 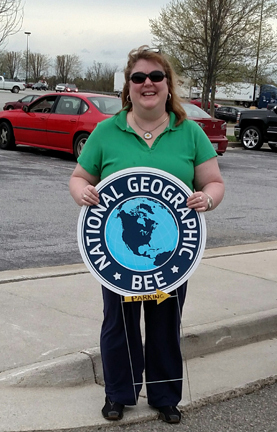 He will represent Virginia at the National Geographic Bee in Washington, D.C., May 22-25. 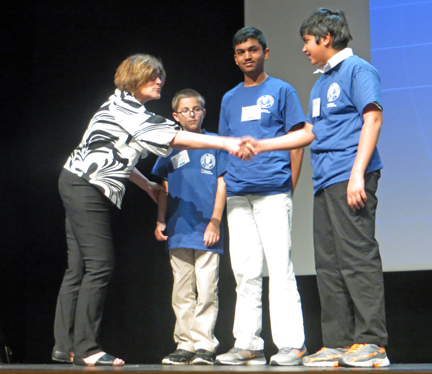 Second place winner was Prithvi Nathan, Gainesville Middle School, Gainesville. Placing third was Austin Copeland, Potowmack Elementary School, Sterling. Congratulations to all three, and especially Vishvesha. 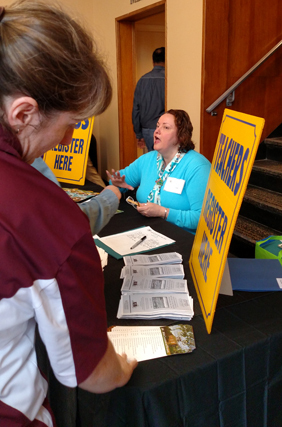 Top, l to r: Penny Anderson directs parents to parking lot; Denise Lam and others man the registration desk; Annie Evans talks with teachers and the press. 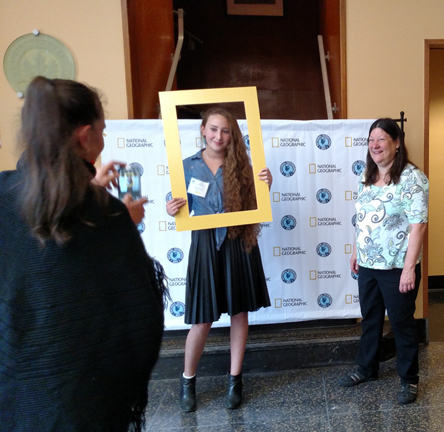 Bottom, l ro t: A students has a photo shoot with the National Geographic logo; Ed Kinman welcomes parents and participants to Longwood University and the National Geographic Bee.